We should have known that when we signed the papers for the house, that cluster of thunderstorms would have grown into a monster. For twenty years now, I’ve been making a list. 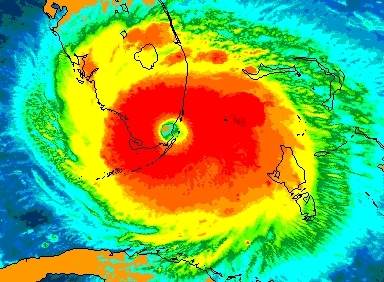 One month before Hurricane Andrew slammed into South Florida, Joe and I purchased our retirement home – and ever since, I have worked on my list, editing it, adding to it, rethinking it. The list has to do with landscaping our retirement yard, which is pretty much a blank slate. Over the years, we’ve planted palm trees – thereby giving us the basic garden structure. But how do I fill in all of the open areas? How do I adapt my very basic Long Island gardening knowledge to a subtropical zone? But each time Joe and I travel to Fort Lauderdale, so too does the list. And with each trip I document what I would like to plant and what I most certainly want to avoid. Here then are a few selections from the list. By chance, we stopped in a local nursery and spotted this variegated Elephant Ear (above). Each camouflaged leaf looked like it had been hand painted. 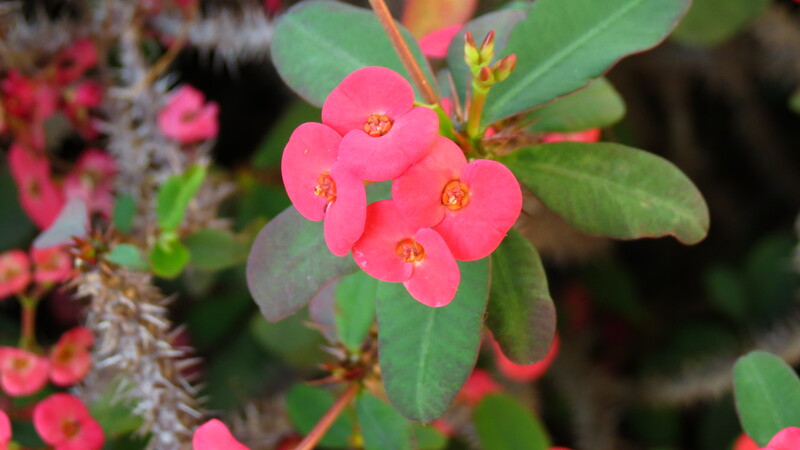 Crown of Thorns (above and below) flowers all year long, and pretty much thrives on neglect. Sounds like it could be the dream plant — but let’s take a closer look at the woody stems. I think I’ll pass on this one. 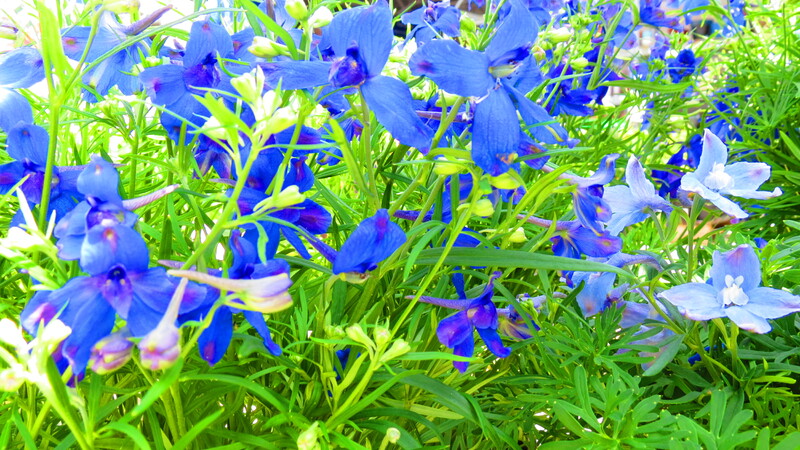 When I spotted these Delphinium (above), I thought it resembled a flutter of butterflies. This has possibilities. 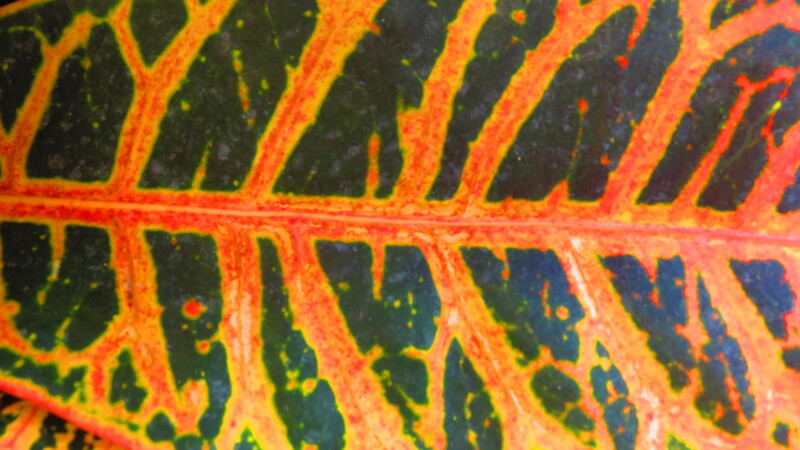 I am a huge fan of Croton (above) — because of the variety in leaf patterns and shapes, as well as the variation in colors. I’ll just have to remember to keep them on the shorter side. From what I’ve observed, if left unchecked, they tend to become woody shrubs with leaves only near its top. 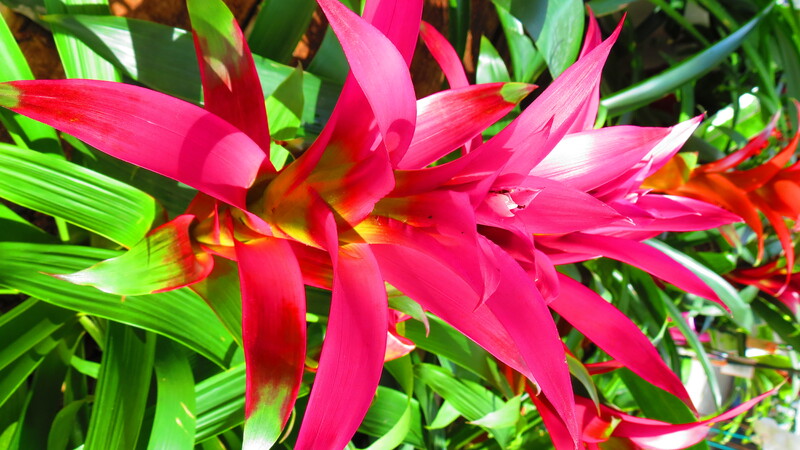 I think I’m going to have a hard time resisting Bromeliads (above). I can practically envision a forest of these tropical beauties. One of the things I do enjoy about South Florida is that ordinary house plants, like this Umbrella Plant (above) become outdoor landscaping plants. I’m thinking of a bed of these variegated plants. I know Bouganvilla (above) also has thorns and that I have a thorny issue, but . . . this is a difficult color to pass up. 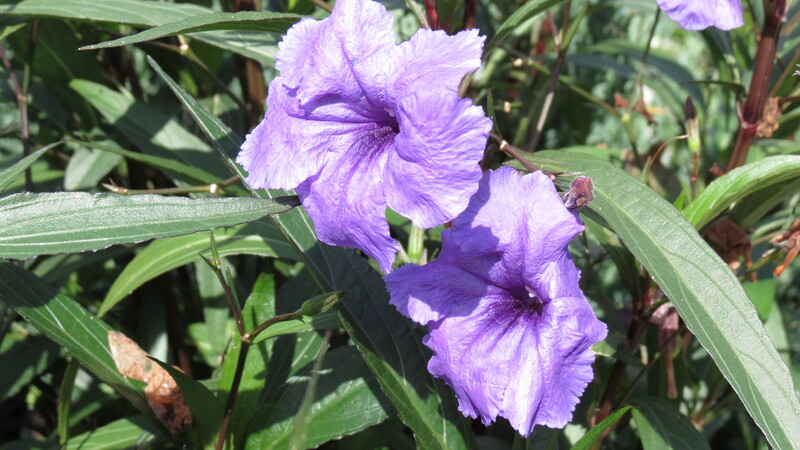 On each trip to Fort Lauderdale, I always seem to be drawn to Mexican Petunia (above). I’m not sure if it’s because they always seem to be in flower or if it’s the dark green leaves against the dark purple stems or a combination of all of it put together. In addition to learning new garden practices, I also have to become acquainted with local garden visitors. 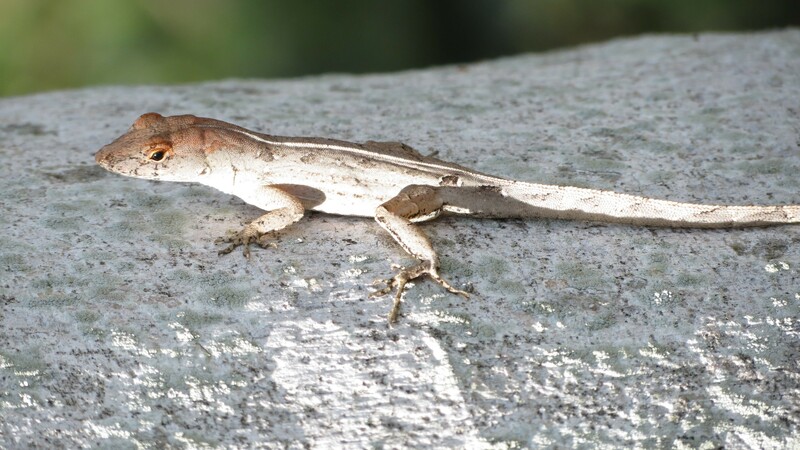 Anoles, like the one pictured above, are everywhere. And no matter how many times they scurry by me, I still jump — but maybe not as high as I did twenty years ago. In time, I guess, we can learn and adjust to anything. But not thorns. Well, maybe not thorns. we are going to be “re-doing” our garden this year, and although I’ve know about it for a long time, I’m still undecided on the way to go – whether it’s certain plants for their leaves, colours, flowers, so many decisions! It’s definitely a daunting task. I find myself driving through neighborhoods, visiting nurseries, and reading for inspiration and ideas. Oh, and I also keep lists and lists and more lists. Good luck with your project! I garden in Vermont’s “Banana Belt” along Lake Champlain along with my husband for whom it is a passion, and I’ve just begun following your blog recently. Was so surprised this morning to read “for twenty years I’ve been making a list…” List-making has been topic of my blog this month, so you might be interested in my musings on the topic. Thanks for sharing your knowledge and your photos. I’m glad you found me, and I must admit — I’ve never heard of the “Banana Belt.” I will definitely visit your post — without lists, I’m lost. So many plants, so little time! 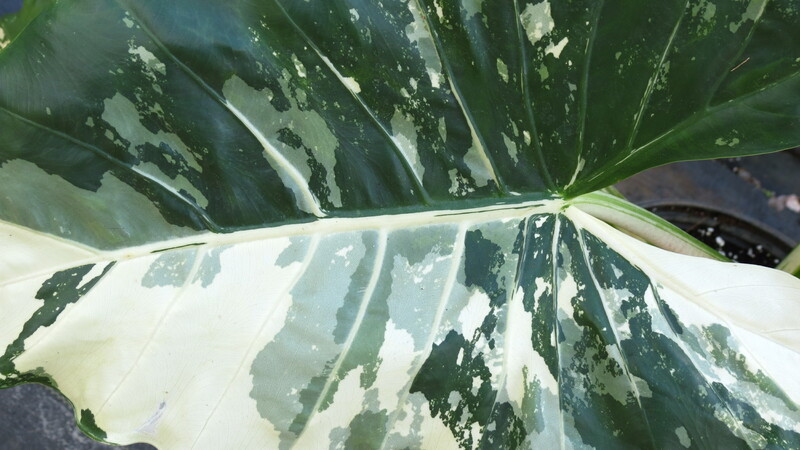 I love those big, fat tropical leaves and all the color in your photos. I suppose I should start my list too…. Debra, thanks for commenting. 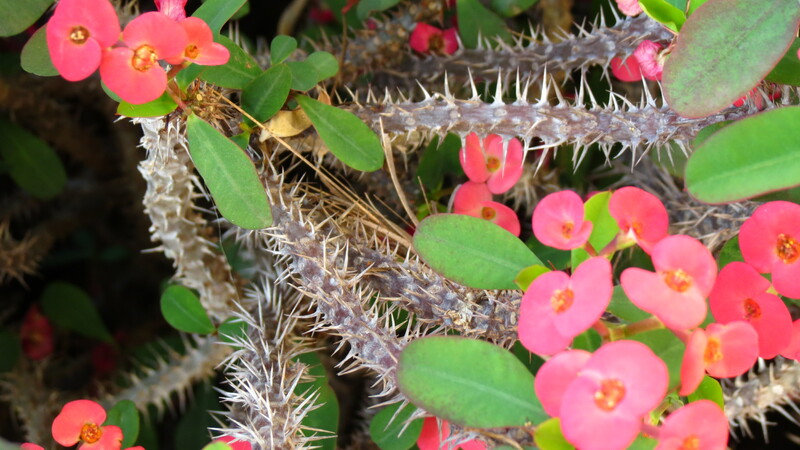 Crown of Thorns is a lovely plant — and I know gardening takes a lot of blood, sweat, and tears — but I’m just not sure if I want to bleed to death. Those spines are scary! 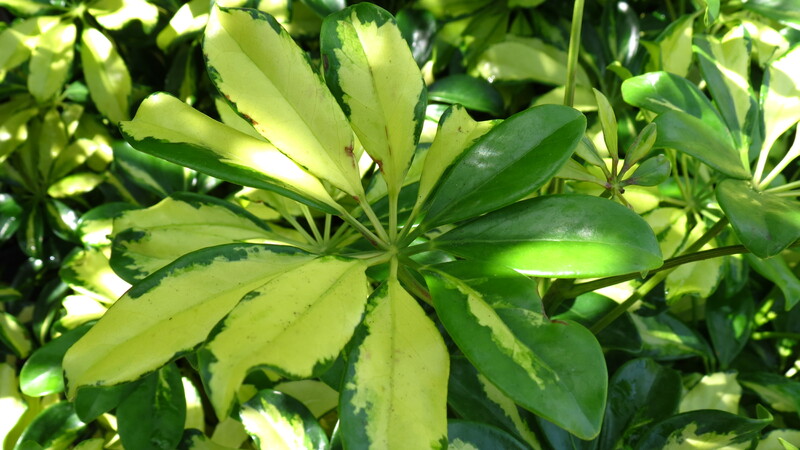 One thing you will soon find about gardening in the tropics (or near tropics) is the need to whack (not trim, but whack) back the foliage frequently, so go ahead and get the crotin. 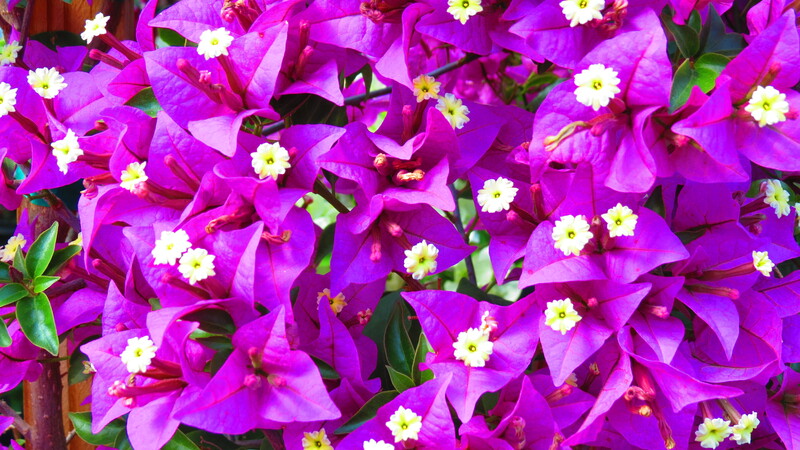 Bougainvilla is wonderful if your area gets any dry periods during the year. It will bloom and bloom on practically nothing. Thanks for the tips. I can certainly understand the whacking. My neighbor planted a banana tree and they now have a small but overgrown grove. So much to learn and explore in your ‘new’ garden. I too am amazed to see houseplants living outdoors. What we often think of as small potbound things are sometimes in reality huge shrubs! I always think houseplants when I see some of these tropical varieties. I have a client that wanted to fly me to Florida to design his gardens there at his summer house. As much as I would have loved the trip, I declined because I have NO experience with those type of plants, except, living in the house where they will never grow as big of full. So much color and unique patterning in plants to our south. Kevin, This brought back memories of my first trip to Florida when I was in my twenties. I was amazed to see all those “houseplants” growing outdoors in the ground! I think this may have been my first introduction to the concept of hardiness zones. Planning a garden for a totally different climate is such a big challenge, but also such a great opportunity. All those tropical colors make me swoon. I still get a rush when I see the greenery in Florida. And I am excited about the challenge. There is a famous Florida gardening book called “Florida, My Eden.” That’s what I say each time my plane lands there.